Bright, smiling eyes. Tight knee hugs. Tiny high 5’s. Occasionally I will get an Anjali mudra greeting coupled with an enthusiastic “Mum-aste!” This is the reception I receive each week at a local Montessori school. These are the voices of toddlers, precious souls around two years old who know my name, I’m sure of it, but to them I’m just “Yoga”. Big boots to fill! I teach to all ages, but my children’s classes, whether they are for toddlers or young teens, are the highlight of my week. 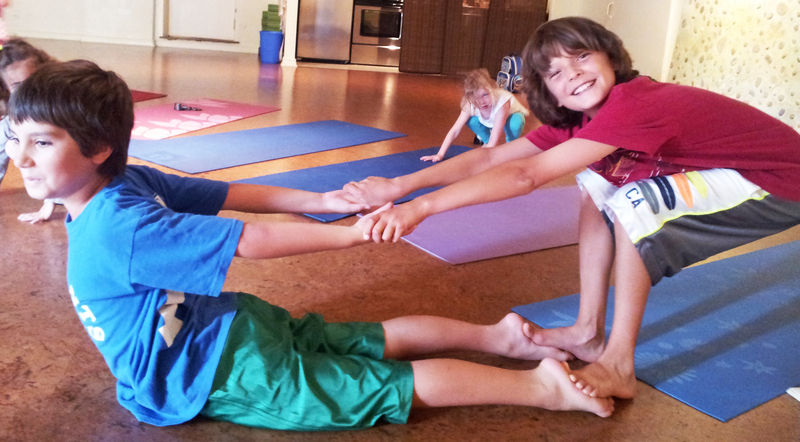 Children derive huge benefits from yoga. Physically, it enhances their flexibility, strength, coordination, and body awareness. In addition, their concentration and sense of calm and relaxation improves. Yoga calms down their highly stimulated central nervous systems, which in turn allows better concentration on schoolwork and other activities. Our summer 2014 kids camp! By practicing yoga, children exercise, play, connect more deeply with their inner life of motivations and emotions, and develop an intimate relationship with the natural world around them. Yoga brings that marvelous inner light that all children have to the surface. We create a space where they are free to explore and be creative without the fear of “getting the right answer” or peer judgment that the school setting sometimes cultivates. If you poke your head into the Spirit Room during Summer Yoga Camp at PranaShanti this July, you may see us dancing wildly to make sure their physical energy is used in a positive, healthful activity. You may catch the children in stillness with a “breathing buddy” (a stuffed animal) on their bellies, as they are soothed to the healing sound waves of the gong. Or you may see us creating a beautiful yoga-inspired picture, talking about the importance of kindness, or learning about how the body works. We learn about new yoga postures by randomly selecting them out of Mr. Box – a tickle trunk that lends a magical quality to camp! And sometimes we talk about how to handle difficult emotions. You will hear lots of laughter and uplifting music. It’s all about balance: sometimes we may be loud … or we may be very, very quiet. The kids will be creating memories, making new friends and laying a firm foundation for bringing all the jewels of yoga into their lives. An immersion into 5 consecutive days of yoga for anyone is a rich experience, even for children. We build from day one, when perhaps they could not sit still with their eyes closed for more than 10 seconds. On Day 5, we may have reached 2 or more minutes. This is huge for a 7 year old! To be in a safe, supportive, non-competitive environment is a breath of fresh air for children. A place for them to express themselves fully and openly. I had a student once who told me that yoga class was the one place where he felt really “at home”. A reminder of why I love being Yoga with these kids. Sat Nam / I see you. 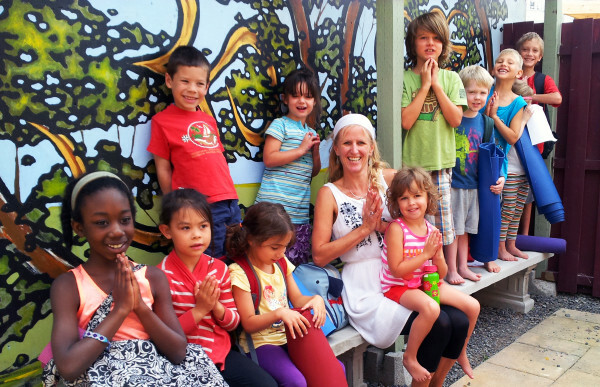 Every summer, PranaShanti hosts a downtown Ottawa Yoga Summer Camp for kids 4 – 9 years at the studio in Hintonburg. This summer, camp runs from July 27 – 31st during the mornings from 9 am – 12 pm. Details and registration are here! After Victoria’s first Kundalini Yoga class, over 10 years ago, she experienced an overwhelming feeling of coming home. The power and integrity of these ancient teachings along with their ability to make significant changes in one’s life in such a short period of time, became immediately apparent. Having a busy life, her own business and being a mother of two growing boys, she was astounded at how a sense of peace, neutrality and strength quickly permeated so seamlessly into her daily life with regular practice. Knowing instinctively that she was meant to teach, she was led to complete PranaShanti’s first Level 1 Kundalini Teacher Training course. Since then Victoria has begun her Level 2 Training, and is also a certified Radiant Child Yoga Teacher. And for the past four years, she has had an ongoing mentor/support role within the annual PranaShanti Level 1 Kundalini Teacher Training Program. Constantly learning and evolving, it is the world has been her recent teacher, and after returning from travels to India and beyond with her two children, Victoria has gained fresh insight into the human condition in a country where Yogic philosophy often underlies the fabric of society. Aside from Summer camp, do you offer children’s programming? Thank you Sheri, we also offer monthly Children’s Yoga workshops. You can find these listed on our Event Schedule. Hi, will you offer yoga camp for kids again in 2019?